Chinese New Year is a time to welcome longevity, wealth and prosperity and to eliminate any negative chi from the past. Chinese New Year (also called the Lunar New Year) occurs in the early months of our calendar year, typically January or February, and this year it falls on January 23rd. 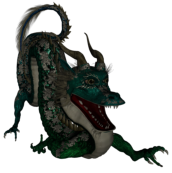 This is the first of 15 days of celebration and the start of the Year of the Dragon. One legend says that the Jade Emperor invited all the animals to come to see him. Of all the animals invited, only the Rabbit, Snake, Horse, Dragon, Ox, Boar, Tiger, Rat, Ram, Monkey, Dog, and Rooster arrived at the palace. In honor of their arrival, the Emperor named a year after each of these animals whose characteristics are thought to be shared by others born in that year. 2012 is the Year of the Black Water Dragon. 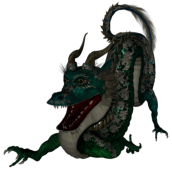 The Dragon is the fifth zodiac location. According to Astrology forecasts, the dragon symbol for 2012 is the year of empowerment. Go here to see more on the Chinese Zodiac. 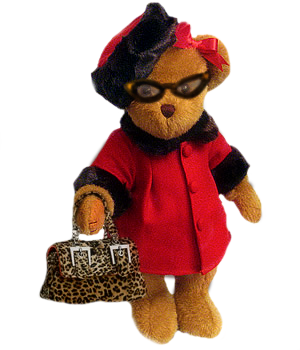 Fuzzy's bear nature has taken him over, and he's currently hibernating. He'll be back with more interesting adventures in the next issue. We are looking for project ideas for 2012, things to build, games to play, or contests to be won. Here are some ideas that have come our way over the past few weeks. Developing a Steampunk village. Had a lot of interest from builders in the Contraption Contest last year. An organised treasure hunt. These have been lots of fun when they were done in the past. Games contest. Build a working, interactive game. It doesn't have to be complex, just fun! Do you have any ideas? Email the Gazette and let us know. yellowgazette@cox.net. 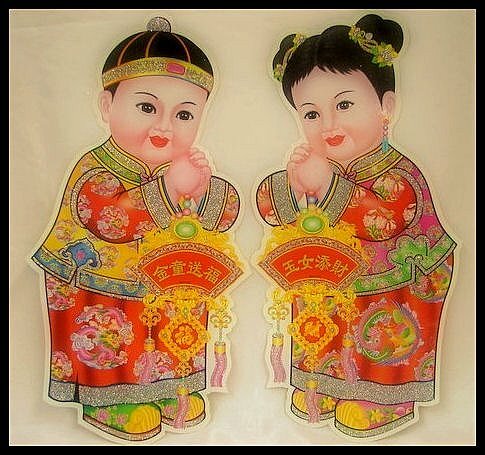 These Chinese New Year decoration pictures are called Gong Hei Fa Choi which consists of one lovely lucky boy and one lucky girl. "Gong Hei Fa Choi" means congratulations on wealth. They are used to glue outdoors to bring wealth. During the Chinese New Year, Kung Hei Fat Choy can always be heard. It's a Chinese phrase, and the meaning of which is 'Wish you a good fortune'. There are also other sayings for spring festival, but Kung Hei Fat Choy is still the most popular and traditional one. We are introducing some new features in this edition of the YG. First, we have set up a special page to help Newbies find their way around Active Worlds. 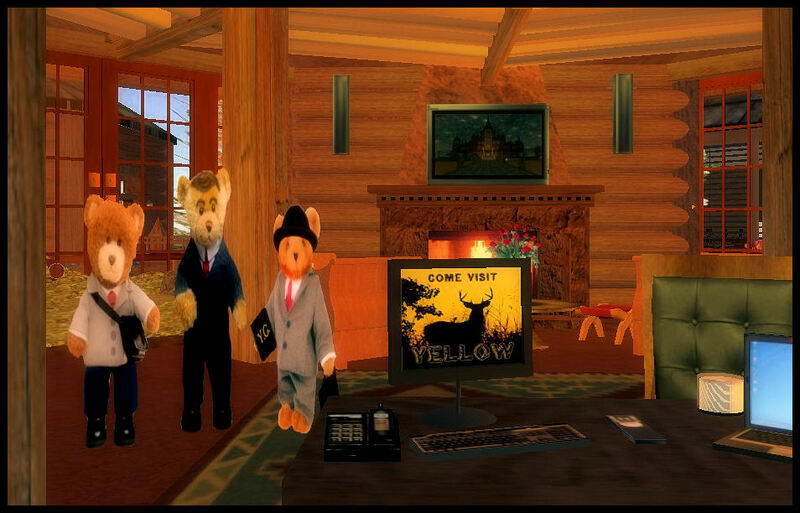 Word has it that lots of people read the YG who haven't visited ActiveWorlds, or Yellow, and we hope this page will help these folks get a bit of a handle on moving around and visiting good places. Caterer Joe now has his own page, and is in the main navigation menu on the left of the page, and on the bottom. Little Nellie and Randy have teamed up now, but we've not yet decided on what exactly to call that page. However you can find their efforts on the Critter Page in the navigation bar. The standard features remain: Builds of the Month, Build Tips and of course the features on this page. We hope you enjoy the Gazette; please contact us if you want to suggest anything for future issues. When we are in the supermarket and someone rams our ankle with a shopping cart, then apologizes for doing so; why do we say, "It's all right"? Well, it isn't all right so why don't we say, "That really hurt you idiot, why don't you watch where you're going?" The statistics on sanity say that one out of every four persons is suffering from some sort of mental illness. Think of your three best friends. If they're OK, then it's you! REMEMBER, A day without a smile is like a day without sunshine! And a day without sunshine is, like -- night.